Former Mets first baseman and Mets announcer Keith Hernandez was unleashed from the shackles of the broadcast booth during Tuesday’s game, mainly to bring a different perspective to the broadcast. But when you send Keith Hernandez out on his own, there’s no telling where he’ll go. 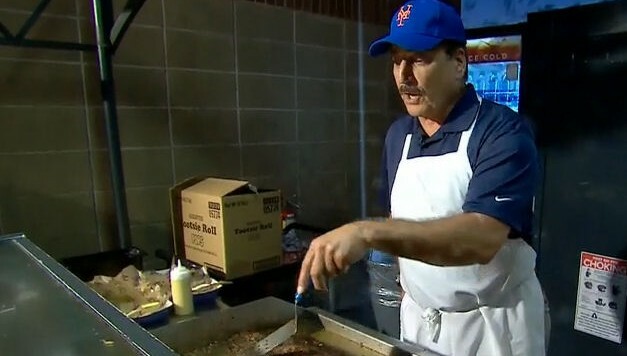 And it was only natural and inevitable that Keith would find his way to the grill named after him at Citi Field: “Keith’s Grill”, to check in on the staff and ask to flip some burgers. It’s almost like watching the newest episode of “Not So Undercover Boss”. Now Keith claims to be experienced at this grilling thing. But as you could see from the video, he started off breaking the first rule of flipping burgers: you never press down on the burgers with your spatula. It squeezes all of the flavor out of the burger. Any experienced griller would know this. Fortunately, Hernandez corrected his mistake. Let’s hope he doesn’t actually do this when he’s entertaining the high society types at his home in Sag Harbor, Long Island. That would be a food faux pas. We're here to track the delicious and bizarre at sporting events all over the country. It doesn't have to have bacon to be spectacular. But it helps. thecomeback.com/FoodandSports is a sports fan web site and is in no way affiliated with any professional sports team or organization, the National Football League, the National Basketball Association, the National Hockey League, Major League Baseball, the NCAA, or any of their respective properties or organizations. This site is for informational and entertainment purposes only. thecomeback.com/FoodandSports is not an official web site for any any professional sports team or organization. Copyright © 2016 www.thecomeback.com/FoodandSports - All Rights Reserved - Trademarks used herein are property of their respective owners. thecomeback.com/FoodandSports is part of the NESN digital network.